The emerging church can best be defined as apostasy. When one reinvents Christianity by redefining Christianity, you no longer have Christianity. This is exactly what we would expect from a biblical perspective as the harlot develops in the last days. 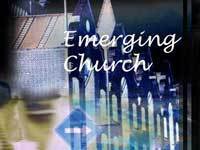 Gathering in cafes and coffee shops, younger believers who are sick and tired of right wing politics injected into megachurches are part of the "Emerging Church" movement. In the Emerging Church movement, no one is told what to believe. Questions are welcome, even if they are about the basic tenets of the Christian faith. In such an Emergent Church in Virginia, members of the "Common Table" gather at a corner cafe under the guidance of a woman named Amy Moffitt, who says, "When I think of the politicization of this church, I think of the political structure of the institutional church that inevitably leads to power struggles and issues around money. And what's really important to me in the Emergent Church is that we avoid that." Moffitt had grown up in Christian evangelism at about the time when it was overtaken over by the Christian right and its politics. Experts say that the Emerging Church movement has the potential to split the Evangelical church but it also has the potential to appeal to the increasing number of disaffected young people who claim no religion.